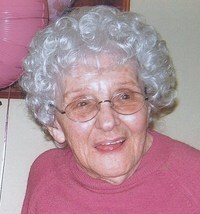 Fay Elizabeth Trostle McCoy, 98, wife, mother, grandmother, sister, passed away peacefully from this life on Saturday, April 27, 2013, with her family by her side at Cumberland Crossings, Carlisle. She was born the eldest daughter of the late Charles “Smoke” and Edna Myers Trostle of Carlisle on May 2, 1914. Fay was a graduate of Carlisle High School Class of 1933. She married her husband Bill on March 4, 1933 and they recently celebrated their 80th wedding anniversary on March 4, 2013. She and Bill were members of the Gettysburg Regional Antique Automobile Club and together had many years of traveling and enjoying antique cars with their friends in the club. Fay was a member of the Golden Age Club of Mt. Holly Springs and the American Red Cross; she also volunteered her time at the former Carlisle Hospital gift shop and snack bar. A long time member of Barnitz United Methodist Church; she was the past president of the United Methodist Women and a loyal and dedicated treasurer for her church. In her lifetime, she enjoyed gardening and painting, as well as bird watching and raising ducks on the pond at her home. She and her husband also enjoyed many years of hosting family gatherings, various church functions and club group picnics at their home before retiring to a smaller home in Carlisle in 1993. Fay is survived by her loving husband, R. William McCoy; three children, Joan Yvonne Posey (Rev. Doctor Harold), Marjorie McCoy- Group (Parker), and William McCoy (Mary Ann) all of Mt. Holly Springs; and one sister , Phyllis James of Florida. She is also survived by 10 grandchildren and 17 great grandchildren. She was preceded in death by three sisters: Georgetta Coulson, Marie Welke and Doris Jean Waugaman. Memorial Service will be held at Barnitz United Methodist Church, on Friday, May 3, 2013 at 11:00 AM, with Rev. Rick Robinson officiating. Family and friends are invited to the Barnitz Social Hall for a visitation and time of fellowship following the service.